When Waylon Harmon was born prematurely and with spina bifida two years ago, doctors and specialists told his parents he’d never be able to walk. But then they found Easterseals. The toddler and his family will be models in the 64th annual Easterseals Ladies Auxiliary Fashion Show on Tuesday, April 16, at the Par-a-Dice Hotel in East Peoria. Waylon is the Easterseals ambassador for the event. “This will be a night of celebrating those who have different abilities. I’ve always felt like I had an extra advocate and someone in my corner with Easterseals,” said Harmon, who will be modeling along with Waylon, her husband, Cody, and their 11-year-old daughter, Hannah. 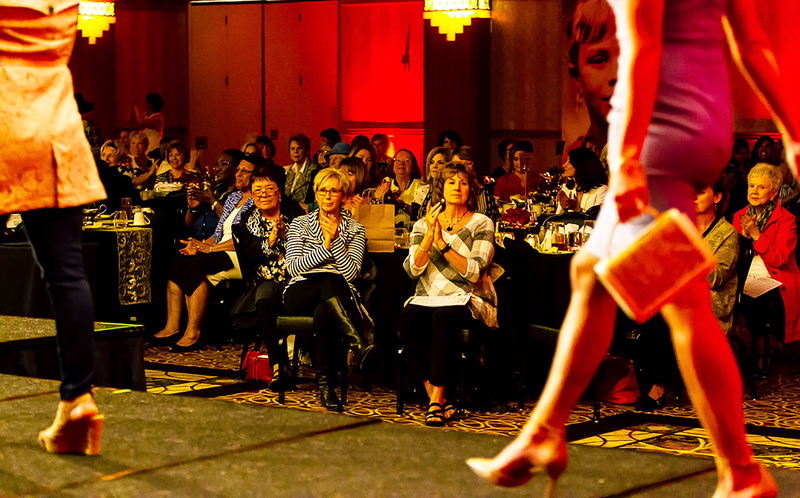 The fashion show began in 1955 as a small event with just over 100 people in attendance and has grown into a fundraiser that generated $40,000 last year to benefit the children of Easterseals Central Illinois. A total of 570 people attended last year’s event. Guests can choose to attend a luncheon show or a dinner show, with both offering fashions from Belle Mie, Brighton, Beth Ann, Men’s Warehouse, Running Central, the Hayloft Shops of Mossville, Pink Sugar, Blue Boutique, Old Navy and A Perfect Pear Boutique. The lunch show will begin at 10:30 a.m. with an opportunity to shop at a boutique featuring unique fashion items by local vendors. Lunch, consisting of a grilled chicken breast salad and lemon curd cake for dessert, will be served at 12 p.m. and the fashion show will begin shortly after. Doors for the dinner show will open at 5 p.m., also with an opportunity to shop from local vendors. Dinner will be served at 6:30 p.m., followed by the fashion show. Dinner includes parmesan crusted chicken with garlic cream sauce, garlic whipped potato, asparagus medley and lemon curd cake. “The Auxiliary Fashion Show has become a tradition in central Illinois, and we are excited to be leading an amazing team of ladies in our efforts to raise funds for the kids at Easterseals,” event co-chairs Helen Chadwick, Ellen Monteith and Gretchen Powell said in a statement. Over the past 64 years, the fashion show has raised more than $1 million to benefit the children and families helped by Easterseals. The Easterseals Ladies Auxiliary has about 40 volunteers who recognize the need to help children with disabilities, said Claudia Revilla, an Auxiliary member who’s heading up publicity for this year’s show. “Every year we have a different theme. This year’s theme is ‘Hearts of Gold’ because Easterseals is celebrating its 100th anniversary this year,” she added. The roots of Easterseals were planted in central Illinois in 1919 with a once-a-week clinic for a few children with disabilities. That small clinic has blossomed into two service centers, the Easterseals Learning Academy and Timber Pointe Outdoor Center, serving thousands of children and their families every year, Pedigo said. As the organization enters its 100th year of serving children and families in the community, the common goal continues to be helping children reach their full potential. “For children with special needs, just one hour of therapy costs $150. Every penny that we fundraise goes to support those children and the services that we provide at Easterseals,” Revilla said. In conjunction with the fashion show, the Ladies Auxiliary will be offering a raffle with prizes, courtesy of Jones Bros. Jewelers and other donors. Auxiliary cookies and bakery items, as well as unique jewelry, fashion accessories and other items from various local shops, will be available in the boutique before the shows. Easterseals serves 1.5 million children and adults with disabilities and their families, offering a wide range of services at 71 affiliates nationwide. Fashion show luncheon tickets are $35 each and dinner tickets are $45 each. Tickets are available for purchase online at www.easterseals.com/ci/get-involved/events or by sending an email to peoriafashionshow@gmail.com.